Taken from My Church and My Faith, by Rev. Nicholas Fedorovich (1st ed. 1969; 2nd revised edition 1974), published by the Ukrainian Orthodox Church of the U.S.A. Pages 7-9. The beginning of the Ukrainian Orthodox Church dates back to 988 A.D., when Saint Vladimir, the Great Prince of Kiev, made Christianity the official religion of his state. However, Christianity had been introduced into the present territory of Ukraine as early as 100 A.D. by Greek settlers along the shores of the Black Sea. With the subsequent decline of the Kiev-Ukrainian state, the Ukrainian Orthodox Church lost her independent status [note that until that point, the UOC was under Constantinople – ed.]. By 1667, Ukraine was divided between Poland and Muscovy. The territory on the left bank of the Dnieper River, including the capital city Kiev, fell to Muscovy; while the right bank, including the province of Halychyna (Galicia, now Western Ukraine) was incorporated into the Polish Kingdom. The former Ukrainian administration, both secular and religious, was broken or exiled. The fall of the Russian Czardom in 1917, evoked great enthusiasm not only among Ukrainians but among all the other non-Russian nations as well. Ukrainians were quick to seize this great opportunity to restore their independent state. On March 17, 1917, a Ukrainian Central Rada (Council) was established in Kiev under the presidency of Prof. Michael Hruscewsky, Ukraine’s foremost historian. Between March and October of 1917 the Rada negotiated with the Russian Provincial under Alexander Kerensky, which refused to recognize the independence of Ukraine. The Rada issued four Universals (proclamations) which distinguished the various stages in the rebirth of the Ukrainian statehood. During the revolution of 1917, Orthodox Churchmen in Ukraine formed a Ukrainian Church Council to introduce measures of rebirth and reformation into the Orthodox movement. A meeting of a Church Council was held in Kiev early in 1918, under the leadership of Archpriest Vasyl Lypkivsky. The activities of this Council were interrupted by a Bolshevik (Communist) invasion of Ukraine, and many churchmen were murdered. It was not until January of 1919 that this Council’s efforts resulted in the establishment of a Ukrainian Autocephalous (self-governing) Orthodox Church. After the final occupation of Ukraine by the armies of Red Russia in 1921, the Communists began a terrorizing persecution of the Ukrainian Orthodox Church. Within ten years, from 1921 to 1931, the Soviet Secret Police had arrested and ruthlessly murdered the Head of the Ukrainian Orthodox Church, Metropolitan Vasyl Lypkivsky; 34 Ukrainian Bishops, and more than 3000 priests. Of the prominent lay members of the Church, hundreds of thousands were arrested, inhumanly tortured in prison; and many were deported to concentration camps in Siberia or Central Asia. The Communist government destroyed 80% of the church buildings in Ukraine, many of which were of great historical and cultural significance. The remaining churches were converted not warehouses, theaters, and occasionally into museums of anti-religious propaganda. All monasteries were closed, and the cemeteries profaned. by 1939 the Communists had completely destroyed the Ukrainian Orthodox Church by forbidding it all activity. During the Second World War, the hard-pressed Communist government renewed some religious freedoms in order to bargain for American military and economic aid. However; only the Russian Orthodox Church in Moscow was revived, and freedom was not granted to the Orthodox Church of Ukraine [although it did flourish in those areas that found themselves outside of Moscow’s control during war -ed.]. Today, as in the bygone days of the Czarist Russian Empire, the faithful of the Ukrainian Orthodox Church can legally belong only to the State-acknowledged (and controlled) Orthodox Church – headed by the Russian Patriarch in Moscow. Today the Ukrainian Orthodox Church can exist without persecution only beyond the borders of Ukraine. It is dispersed about the globe, throughout many countries of the Free World. The greatest concentration of Ukrainian Orthodox faithful is to be found in North America. In the United States there are some two million descendants of Ukrainian immigrants. Historical evidence indicates that the earliest Ukrainian settlers arrived to these blessed shores before the American Revolution. The largest influence in numbers occurred between 1890 and 1914, when thousands of hard-working peasants came each month from the Austro-Hungarian Empire, mostly from the Western Ukrainian provinces of Galicia and Bucovina. After the Second World War, a new wave of Ukrainian immigrants arrived in the United States and Canada. They came escaping the threat of Communist invasion of Free Europe. These new immigrants included a large proportion of young Ukrainian professionals, scholars, and university students, who have made a substantial contribution to modern American technology, science, and the arts. They have immensely enriched the Ukrainian cultural and religious and religious heritage in the United States and Canada. The Ukrainian Orthodox Church in the United States and Canada was organized soon after the First World War, and was composed mostly of those Ukrainians who immigrated here from the Austro-Hungarian Empire. The majority of these pioneers of Ukrainian Orthodoxy – were at one time Greek Catholics, or Uniates (united with Rome). Familiarizing themselves with the history of Ukraine, they recognized more clearly that the Church of their Forefathers – was the Orthodox Church; that the Church Union with Rome (1596) was forced upon Western Ukraine by old Poland immigrants returned to the Church of their ancestors. Their return was also hastened by the hostile attitude of the Roman-Catholic bishops in the United States and Canada – towards the Ukrainians of the Greek-Catholic Faith. Today the Ukrainian Orthodox Church in the United States has its own hierarchy (Church governing body), which is composed of a Metropolitan (Primate of the Church), three Bishops, and over a hundred clergymen. The Head of the Church is His Eminence, Most Reverend Mstyslav (Skrypnyk), who has directed the destinies of our Church in the U.S.A. as the President of the Consistory for nearly twenty-five years. His cathedral is the Church of Saint Vladimir the Great, in Philadelphia, Pa. The administrative offices (Consistory) of the Church are located in South Bound Brook, New Jersey, as is the residence of the Metropolitan. The president of the Consistory is the Protopresbyter Artem Selepyna. 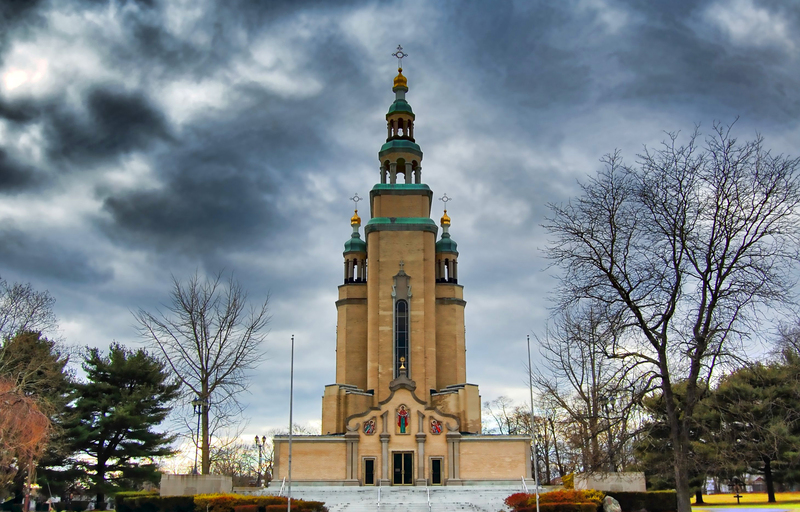 The official organ of the Church, the Ukrainian Orthodox Word (Ukrainian and English monthly editions) are published in South Bound Brook, N.J. The administrative center includes a publishing house, the central Archives with priceless items of Ukrainian culture, and an extensive library, with more than 40,000 volumes, etc. Over one hundred books were published in this modest printing shop, in both languages. All through the efforts of our present Metropolitan Mstyslav. A Museum of Ukrainian Heritage includes a priceless collection of historical and religious documents and relics from the Ukrainian past. This museum and other cultural institutions were organized through the untiring efforts of Metropolitan Mstyslav, a great patron of Ukrainian church art and culture. For over two decades Metropolitan Mstyslav has capably and tirelessly administered our Metropolia. He has served as President of the Consistory for almost twenty-five years. other Bishops of the Metropolia are the Most Reverend Archbishop Mak (Hundiak), with his cathedral seat at the Church of Saint Vladimir the Great in New York. his residence is in Saint Demetrius Church, Carteret, New Jersey, where he has faithfully served as the pastor of his spiritual flock for over four decades. Right Reverend Bishop Constantine (Buggan), born, educated, and ordained into the Holy Priesthood in his native Pittsburgh, Pennsylvania. His cathedral seat is the Church of Saint Vladimir the Great, Chicago. The jurisdiction of Archbishop Iow (Stakalsky) comprises the parishes of the Ukrainian Orthodox Church throughout South America. In Western Europe, the parishes of the Ukrainian Authocephalic Orthodox Church are under the jurisdiction of His Eminence Metropolitan Mstyslav. he is the spiritual leader of the Ukrainian Orthodox faithful residing in the following countries: West Germany, Austria, Belgium, France, and England. The Bishop for the faithful in Western Europe and England is His Grace Orest, who resides in West Germany. A number of Ukrainian Orthodox parishes are also found in Australia and New Zealand, where they are well organized and have their own Bishop. A majority of the parishes are under the jurisdiction of Metropolitan Mstyslav. The Ukrainian Orthodox Church is also very well established in Canada, where its official name is “Ukrainian Greek-Orthodox Church of Canada.” The Consistory of this Church is located n Winnipeg, Manitoba. The President of the Consistory is Very Rev. Dmytro Luchak. Saint Andrew’s College, the only theological institution of Orthodox Ukrainians in the Free World is also located in Winnipeg. St. Andrew’s College recently became affiliated with the University of Manitoba, and is now established with modern facilities on the university campus. The principal of St. Andrew’s College at the present time is Prof. L. Tomaschuk. Most Reverend Archbishop Michael is presently the Primate of the Ukrainian Greek-Orthodox Church of Canada and heads the Eastern Diocese of the Canadian Metropolia. His cathedral seat is located in Toronto, Ontario. The Western Diocese is under the spiritual leadership of the Most Reverend Archbishop Andrew. His cathedral seat is in Edmonton, Alberta. The Rt. Reverend Bishop Boris has jurisdiction over the Central Diocese of Canada. His cathedral seat is located in Winnipeg, Manitoba. In solemn commemoration of the tremendous sacrifices made by Ukrainian people, a grand monument, the Memorial Church, has been established during the past decade. 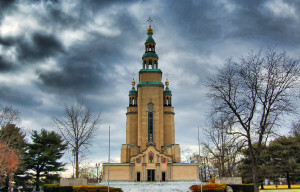 This unique Shrine, a gem of Ukrainian architecture, was constructed at South Bound Brook, New Jersey, the center of the Ukrainian Orthodox Church in this country. The internal decoration of the Memorial Church is still in progress; by the end of 1968, a magnificent iconostasis was installed and solemnly blessed. The spacious grounds of the Memorial Church include an impressive cemetery – a historical pantheon – where many prominent Ukrainians are buried: generals, statesmen, poets, writers, and others. The earliest tombs at the cemetery date back to the Revolutionary War. The Memorial Church is not only a House of Worship. To our older generation it stands as a symbol of struggle for the freedom of worship that was made by the enslaved Ukrainian people, still undefeated and unbroken in their spirit. To our younger generation, the Memorial Church will be an everlasting reminder of their ancestors – the deeply religious nation with a glorious and heroic past. To our fellow Americans, this impressive monument is a majestic and convincing witness of many sacrifices made by Ukrainian people; it will manifest to them that on this free continent we are the first enemies of the godless Kremlin, because we were the first victims of Communist aggression. In February of 1972, the highest officials of our Metropolia signed a contract which bound the purchase of an additional 50 acres of land adjoining the present property of our Church headquarters in South Bound Brook, N.J.
During the summer vacation, many Ukrainians and their friends come to South Bound Brook, to visit the Memorial Church, and to admire its many historical and cultural treasures. Why not include a visit to this unusual and scenic site for yourself?